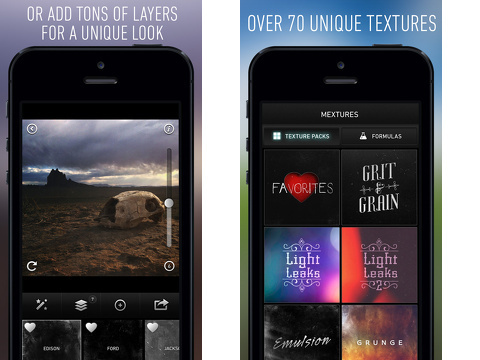 The Mextures iPhone app is a sophisticated iOS photography app with innovative tools and intuitive gesture controls. The Mextures iPhone app is clearly designed to help you create layered, nuanced photographs with your iPhone’s camera. There is a curated feed of photos transformed with the Mextures iPhone app, but the seamless sharing to your existing social networks makes it a tool more than another social network to manage. 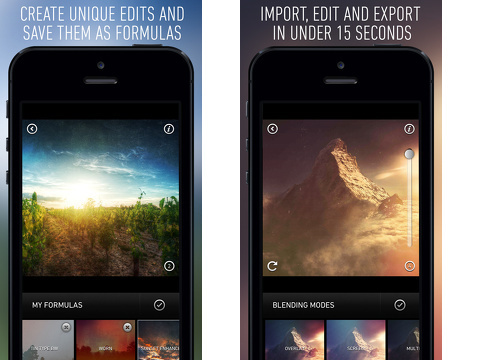 The Mextures iPhone app opens with three simple selections at the bottom of the screen. With a touch on the camera icon, you open the in-app camera to shoot a photo. With a touch on the flash icon, you will find a feed of curated photos. The graphic vibe of the curated photo feed strikes me as a modern take on old-school polaroid photos. The photo is simply framed with the user name. The final selection on the screen is your library. You must authorize access to your iPhone photo libraries to use existing photos. After you shoot a photo or select one, you move through a series of photo editing screens. The first screen has three simple options at the bottom to cancel, don’t crop, or crop. You move the part of the photo into the highlighted box with pinches and swipes. The next screen gives you a chance to change your photo from a photo to a mexture. The interface is similar to a shopping iOS app. You can sort between texture packs and formulas with one touch at the top of the screen. Thumbnails of the photo filters and formulas are arranged in a matrix at the bottom of the screen. You swipe vertically to access all of the options. The texture packs are the filters that change the light and texture of a photo like Instagram. The filters are grouped in categories like grit and grain, light leaks, emulsion, grunge, landscape enhance, and vintage gradients. The formulas feed is home to your saved photo filter applications and photographers’ suggested applications. When you touch a texture pack, you move to a new screen. The photo fills the top third of the screen. You can adjust the intensity of the filter by swiping vertically on the volume adjustment on the photo. Just below the photo there is a menu bar with photo editing tools. At the bottom of the screen are the selections of filters. You scroll through the filters with horizontal swipes. With a touch, the photo is filtered. You can touch the starred icon to open blending modes like soft light, color dodge, and color burn. For each mode, you can adjust the volume bar on the photo to change the intensity of the blending mode. When you have completed any adjustments, you can touch the plus icon to add a new layer. You can add a layer from the same texture pack or select one from a different texture pack. A tally of your layers and description of the application is accessed with a touch on the icon between the blending mode icon and plus icon. A neat feature is to favorite a photo filter, so you can find it quickly. When you have completed your multiple layers of photo editing and filtering, you press the share icon. You can save it to your photo library and save the current formula to easily replicate the photo’s texture. You can open the photo with compatible iOS apps like Tumblr, Dropbox, Google Drive, Path, and Snapseed. You can also share it to Twitter, Facebook, Instagram, and email. The unusual and unexpected opportunity to transform your photos with multiple layers of filters in such a simple, elegant interface distinguishes Mextures from the extremely crowded field of iOS photography editing apps. AppSafari review of Mextures was written by Jenni Ward on July 10th, 2013 and categorized under App Store, Photos, Utilities, Video. Page viewed 4026 times, 1 so far today. Need help on using these apps? Please read the Help Page. Thank you for writing this article! Success!